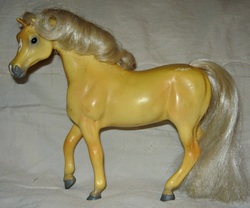 Wildwing Angelique-1982 palomino. Sired by Aheme, out of Quiet Antics (TB). 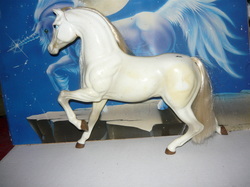 Bred by Wildwing Model Horse Stables. CD Hello Kitty-1989 bay. Sired by Bold Antics (TB), out of NTS Pretty Kitty (anglo arab). 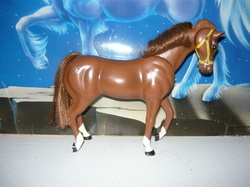 Bred by Wildwing Model Horse Stable. Please note I didn't name this horse. I accepted the pedigree and id. KSW Willow-1994 gray (chestnut base). Sired by Relaunch-r (TB), out of Padronafa (Arab). Bred by Twin Springs Stables. Wild Honey-1997 liver chestnut. Sired by Figure (TB), out of Nibbles (Arab). A Secret Romance-2014 buckskin. Sired by Vakarian (TB), out of Kamas Nefertiti (Arab).